Quicken Trust is getting closer with its plans to build a community centre at the heart of Kabubbu. It will complete the community development in a village where — at the turn of the century – AIDS, malaria, unemployment and poor education prospects had left a feeling of hopelessness across the generations. New plans have had to be sought to create a more aesthetic building within a rural community. These are now coming to fruition. “The centre will be our ‘Jewel in the Crown’,” says Quicken’s founder, Geoff Booker. “It will be a visible and safe place at the heart of the village.” The Trust has bought the land, close to the bustling crossroads of the trading centre. Now it’s launched a fundraising campaign for the £150,000 to build and equip the centre. Click here to help create the Church & Community Centre. 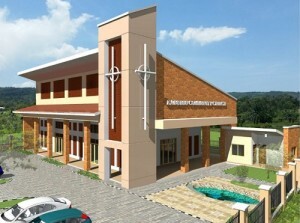 Kabubbu is not short of churches and Quicken established a new one at the Trust High School in 2006. (Kabubbu Church). It is thriving – but it doesn’t work for everyone. In fact, it might be restricting the growth of the church locally. That’s partly because while the vibrant nature of the worship suits the 350+ teenagers who attend Kabubbu Church – it’s less appealing for some older members of the community. And for some local Christians, whose experience of education was not good, having to meet in a school can be intimidating. Rather like the church spires of English villages, the new Church building in Kabubbu will be unmissable. There will be a prominent cross on the front visible over the roofs of the single storey shops in front of it. And it will be lit up.